We're guessing you want to book demos. Lots of them. Sharing a direct scheduling link. In this article: we will go over the essential setup in just a few steps! Drift integrates with your personal calendar, with support for Google and Outlook. The integration will automatically check your busy time slots and make sure that meetings never get double-booked for you. Before moving on, make sure that you're happy with your Meeting Types. You can create different types of meeting, differentiating in Location, Duration, etc. Meeting types that aren't your default type need to be manually linked/dropped in conversations! Any of your Sales reps who are going to be booking meetings need to build their Profile so that people know who they're booking a meeting with! Here's my profile, highlighted with the most important things to add before booking meetings. If you need, here's the doc on editing your profile! Once you've connected your calendar, the Meetings Dashboard is your home for all things meetings! 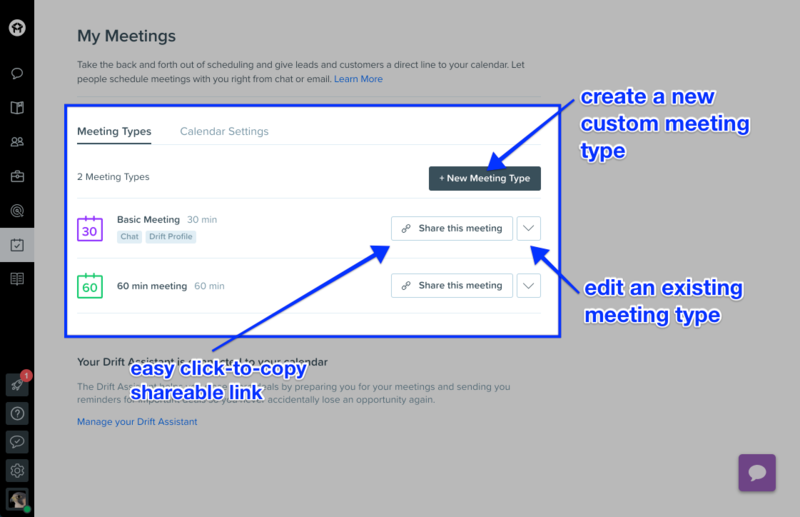 From here, you can easily copy and share your personal meeting link, set a weekly meetings goal, and see which of your teammates are booking the most meetings (we love friendly competition). In the left-most box, you'll see your scheduled meetings for the day, or a link to your personal meeting type to share with prospects. 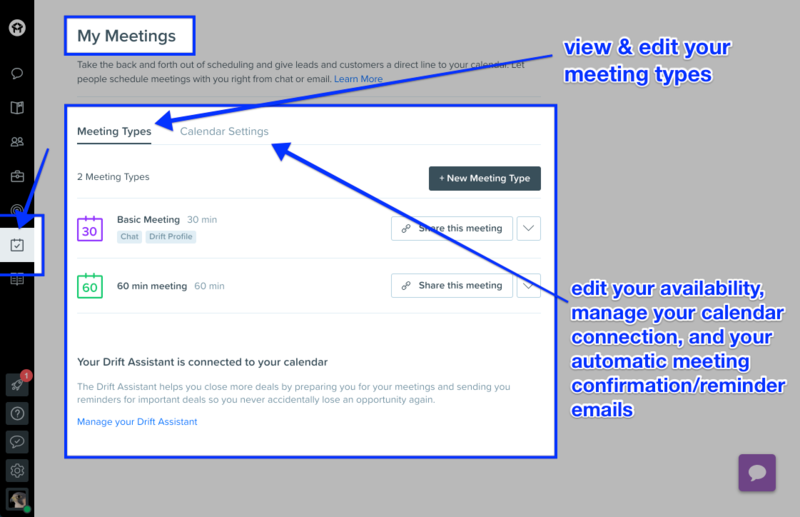 Clicking the ellipsis will allow you to teleport right to your connected calendar, manage your meeting types, or learn more about how to leverage meetings with Drift! The middle section is where you can set and track your progress against your weekly meeting goal! And on the right, you'll see your team's meeting leaderboard (we love friendly competition). Have questions? Let us know. Not using Drift yet? Sign up for free here.